Cohousing was catapulted into success in Denmark with the collaboration of two cohousing architects, Jan Gudmand Hoyer and Vandkunsten, a Danish architecture firm. The idea, it takes a village to raise a child, was the force behind this movement and getting there was going to involve future residents in the decision-making process. Their project Trudeslund knocked it out of the park. In fact, they did so well, they inspired more cohousing communities to be created across the country. Suddenly, several cohousing communities were successfully built and architects were trained, based on this model. I was fortunate to be one of these architects. I invested my entire adult life to this concept of community-designed living because I saw how it improved the quality of life for those who participated in it. I know that other architects have the same mindset - in fact, I have trained a few over the years. But having the desire to help cohousing groups get started is a complicated process, especially if you are new to the world of development, architecture, and consensus-making. Projects that work with untrained architects might look in-fashion, but the glue that holds the community together often falls apart, if it is there at all. 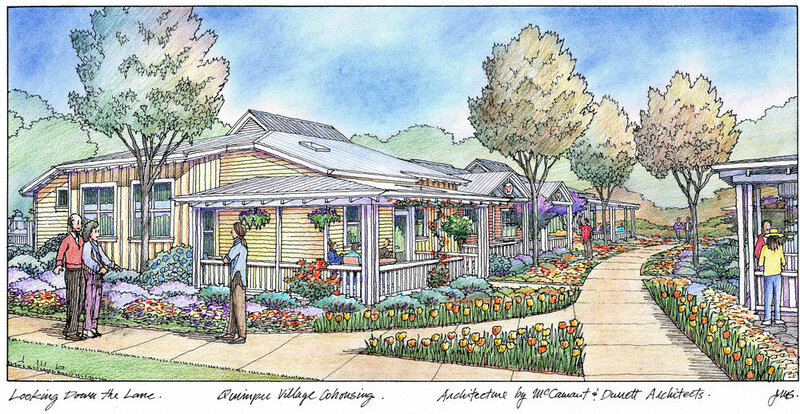 Homes in successful cohousing communities have the same handsome appeal and they work socially. As cohousing becomes more desired, it is important that the architects who will facilitate future projects are mentored, just as I was, by successful cohousing architects. That way, they too can contribute to bettering the future lives of their city and larger community. Cohousing projects don't succeed just because the future residents are motivated. They don't succeed just because the architect is a nice person. Each project needs the guidance of someone who has experience and knowledge. 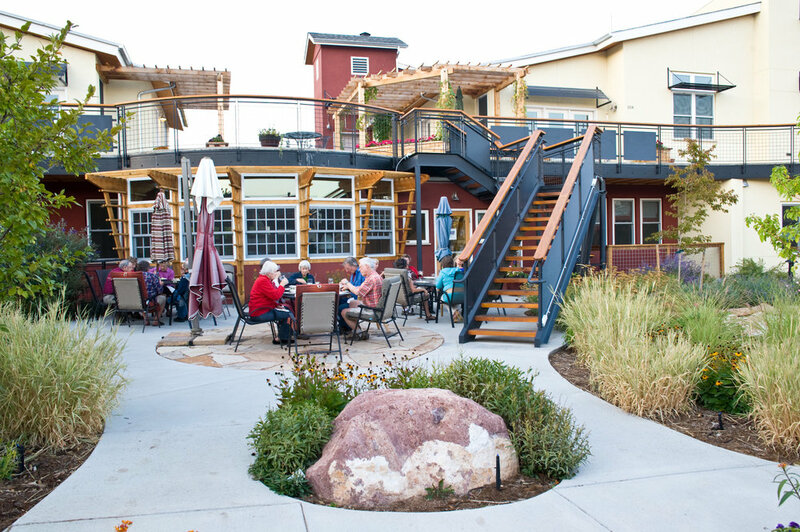 Groups that hire cohousing professionals save money and time. They live every day the satisfaction that they did it the right way. For the past 30 years, MDA has offered internships to architects who aspire to get cohousing into their towns or cities. We've trained several architects who are now guiding cohousing communities across the U.S. and around the world. Most of our 50 interns to date have been from overseas (seven from Denmark, ironically); five from Germany; two from Indonesia (interesting); one from each of the following Iraq, France, South Korea, Columbia, Australia; and so on. Only about ten from the U.S. and none from Canada. Although I like helping other countries see some of the in-depth tricks of designing high-functioning communities, America still has a huge negative ecological footprint. Demand continues to grow and MDA has decided that it makes sense, socially and environmentally, to focus on training architects in North America. Our next internship starts this fall - a six-month on-the-job training - and we're looking for architects in the U.S. and Canada who want to learn how to think outside of the box and create eco-groovy, socially-sustainable housing. Interns learn specific facilitation techniques and successful design elements that are fundamental in cohousing. 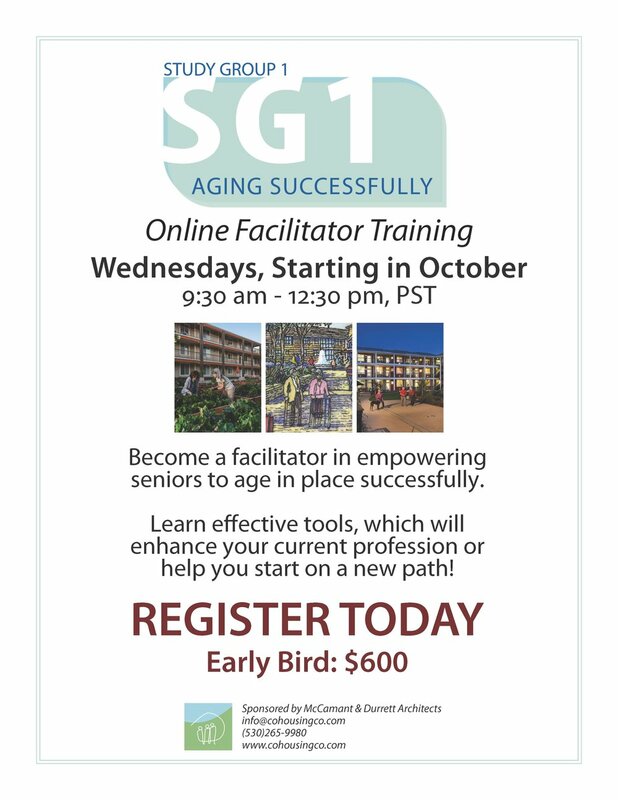 They receive specific instruction on how to move projects from beginning to end and how to replicate this while adhering to the nuances of future groups. It's not about recreating the wheel. Instead, cohousing thrives in the knowing that the technique is proven effective. What is the future in cohousing? It lies in the hands of professionals sharing knowledge with professionals. When more trained architects adopt cohousing as a modality in their practice, those who are interested will make themselves known. It's already happening - we receive several inquiries with regularity, from groups looking for a trained professional in their region. When more interest grows in an area, local government and businesses will also jump onboard, if they're not already in support of creating high-functioning neighborhoods. Once the wheel gets going, there's no telling how big the reach. Adding cohousing to your offering of services as a trained architect will lead to growth in your firm. Now, more than ever, it is important to see the potential in the cohousing movement and join in. A six-month internship is a drop in the bucket when it comes to the value you'll add back into your community. Trust me, I've seen it clearly in mine. So, if you're interested in learning how you can become a cohousing architect, we'd like to hear from you. From CoHousing Solutions' newsletter published Dec 2017. As we approach the Winter Solstice, I’ve been thinking of the full cycle of life we get to experience here in my intergenerational community, Nevada City Cohousing. I suspect that I am not the only one that finds this to be one of the more profound appreciations for living in community, for ourselves and for our children. In the last weeks my community has been holding so much love for so many. For one neighbor who recently died, too young as she was just in her early 50’s, the community has been there to support her and her family in any way we can. And in return she shared and taught us so much. Another neighbor mentioned that her mother, who lives a few blocks away, had become close with this woman, and that sharing her passing has opened up an opportunity to talk with her mother about death. “What a gift (our neighbor) has given me,” she tells me. On a recent Saturday night, another neighbor held his 46th birthday party in the common house with a rock-and-roll band made up of his fellow junior high teachers. Softening us up, he fed the community tacos and his new home-brew, made from hops grown here and brewed in the common house. Can’t get much more local than that! And that also helped to soften any complaints about the rock and roll band later…good technique. And then Sunday afternoon, all the women of the community, from 3 to 80, gathered in the common house to celebrate another neighbor’s pregnancy. We are all so excited to have a new baby coming! We shared stories, wishes, cake and tea. One neighbor is coordinating our community quilt for the baby. Another neighbor is knitting blankets for the new baby, and the baby’s older brother, while she worries about her husband’s cancer returning. 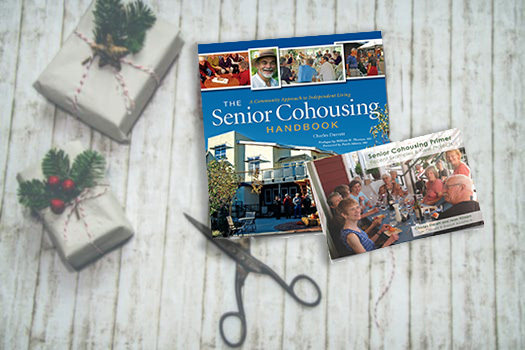 In cohousing, all of these major life events can happen at home with much more support from the community. Written by Katie McCamant of CoHousing Solutions. 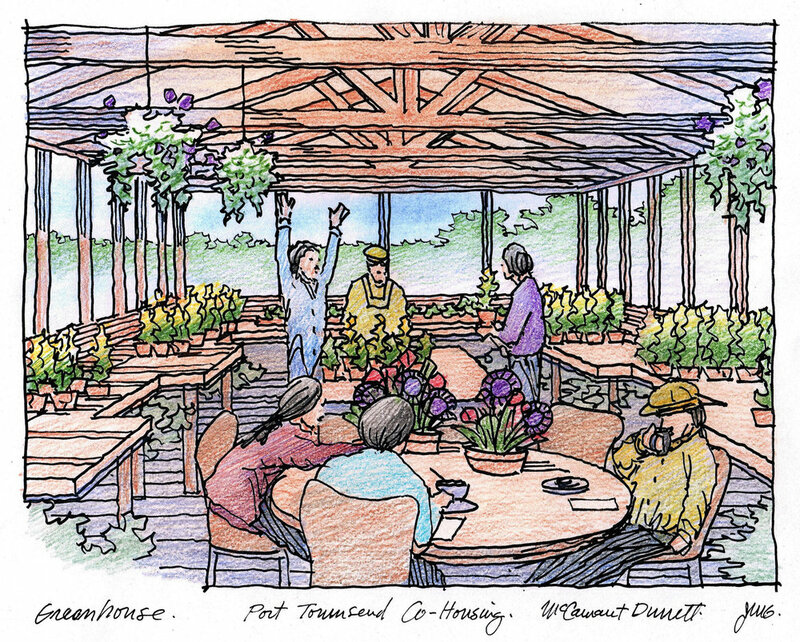 The value of thinking about the "things"
Village Hearth Cohousing recently completed the Design Development and Prioritization Workshops (Workshops 5 and 6) with McCamant & Durrett Architects. Through the years, groups often ask me, “why do the workshops matter?” My answer is simple: Cohousing isn’t about reinventing the wheel. As you read on, you’ll see how the later workshops are just as important as the earlier ones and why each plays an integral role in the success of a cohousing community– in making it theirs, the one that fits like a glove, one that they own, emotionally. They are where trust it built. These participatory design workshops are where the community is built, not brick-by-brick but decision-by-decision. At the surface, the Design Development Workshop (Workshop 5) is focused on stuff: hundreds of commercial products. The details and even the “stuff” have a profound impact on the success of communities, right alongside large-scale decisions like the site plan and common house design. For example, consider your windows. A typical homebuilder in your area might select one window brand, while we might select another. There are many other reasons we have selected this window, but ease of operation and clarity of view alone make it ideal for senior cohousing; as you walk home and see a neighbor at the sink doing some dishes, you can wave to them, they can easily and quickly open the window, and you can chat or make a date to meet up at the common house. Altogether, the ensemble of products will form a tapestry that makes your house and your community feel like home. This workshop is also important for the success of a community in the context of the development process. The Design Development Workshop is not just about energy efficiency, but that’s a big part of it. The process we facilitate -- based on years of experience and researching specifics to your region -- will enable you as a group to arrive at high-quality decisions by making effective use of your time and effort. This workshop is where costs that are perceived to be potentially above the budget are prioritized. Amenities are prioritized based on lifestyle, sustainability, facilitating community and all of the other goals and values of the group. Some amenities can be offered as options on a household-by-household basis (e.g. washing machines hook-ups, etc.) and others omitted completely (and others added.) The workshop process ensures that all members’ input is included and evaluated, at the same time, with all the necessary information on the table, using a very deliberate process. The Prioritization Workshop is a very values-laden workshop. While reconciling little creature comforts, it will be important and sometimes challenging to keep the big picture in mind (community, cost, aesthetics). 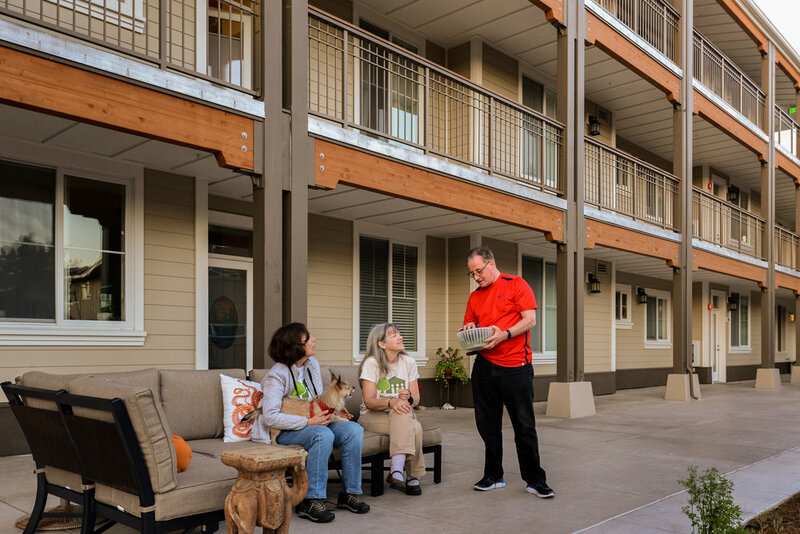 Though these little creature comforts are equally important because if we’re going to make community real, we have to make it even more comfortable than typical homes—which turns out to be very easy to do. 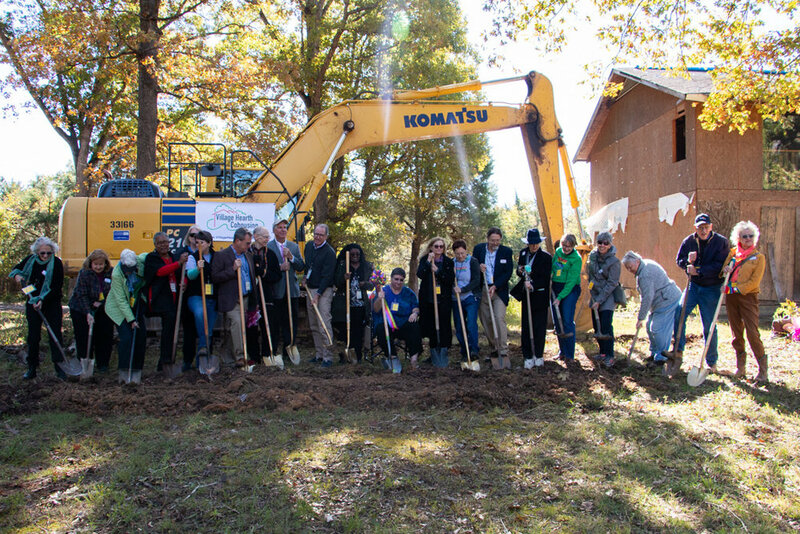 Both Design Development and Prioritization Workshops symbolize a huge step forward to getting a cohousing community built, including maintain a control on budget and finding what works for the entire community. This structured and intentional process allows groups to arrive at high-quality decisions in a matter of months, rather than other communities we have watched arrive at lower-quality decision after years of wasted time and energy, too much acrimony, and too many people dropping out of the group as a result. If you’re interested in learning more about how the design workshops can influence the creation of your community, let’s talk. On the bright side, the concept of Cohousing is becoming increasingly entrenched in the American imagination— with every new project, what was once a culturally radical and shot in the dark neighborhood experiment is now an empirically supported investment into well-being and sustainability. Unfortunately, Cohousing's success has enticed others to appropriate the term for their own— entirely unrelated— housing projects, which do not adhere to Cohousing's Six Defining Characteristics. While many of these individuals do so with positive intentions, at the end of the day, the flippant use of the term "Cohousing" does far more harm that good. First and foremost, a liberal application of the word Cohousing dilutes the term such that it loses its influence as a proven, viable concept. In this country, getting any large housing project built that does not prescribe to the typical stick-built, muted, and grandiose American formula remains a challenge. Credibility— among lenders, developers, and buyers— is essential for these kinds of projects. Over the years, Cohousing has earned this credibility, but nonetheless cannot afford to be conflated with other alternative housing models, even if those models are admirable and effective in their own right. 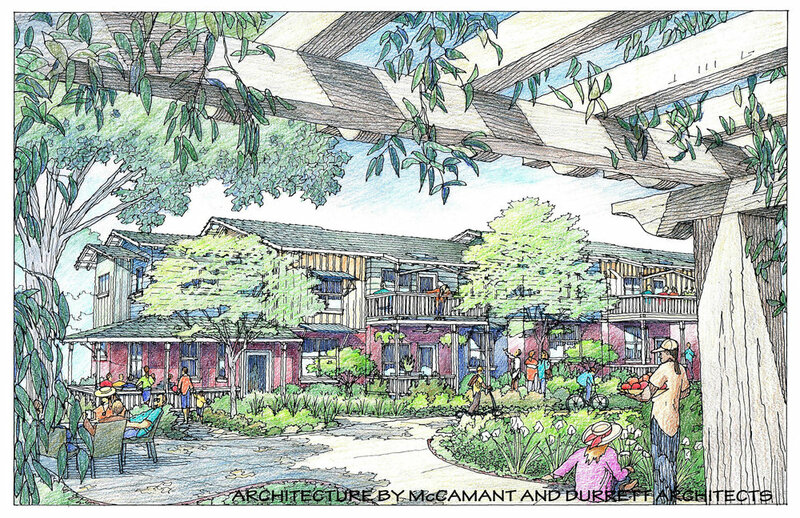 Furthermore, a lax use of the term Cohousing puts the concept at long-term risk of alienating certain demographics that might otherwise benefit from such a neighborhood. Individuals often choose to detach the term from its actual definition because, for them, Cohousing suggests certain values that they want associated with their particular housing project. Unfortunately, this is a slippery slope. At its most basic level, Cohousing is simply a sustainable, democratic, and pragmatic neighborhood model— something most Americans across the political, geographical, class, and generational spectrum can respect, if not choose for themselves. If Cohousing is permitted to become a catchall term associated with the next edgy, alternative neighborhood experiment, the word may lose its universal appeal and therefore, its effectiveness. Cohousing— which is designed intentionally to be accessible to a wide variety of Americans— could become an exclusive, value-laden term. Moreover, the misapplication of the term Cohousing is disingenuous to consumers, and often resembles an unethical bait-and-switch sales model. Though every neighborhood is unique, the base model of Cohousing is the product of numerous mistakes, countless experimentations, and literally hundreds of thousands of man-hours. The concept has been through the wringer and has emerged intact, even stronger. To slap the proven Cohousing label onto something dissimilar— especially onto the occasional half-baked housing project that is doomed to fall short of its goals— not only delegitimizes others' hard work, but is misleading to potential buyers. Finally, in the uphill battle to create synergistic communities amid a culture of militant individualism, we owe it to ourselves to respect the work that has already been done. Cohousing is not the be-all and end-all of high-functioning neighborhoods— innovative neighborhoods of the future will continue to reveal new and important insights about effective community living. However, when we confound the triumphs and struggles of Cohousing with those of other, disparate housing models, we complicate the work of tomorrow's housing leaders. Cohousing means something, and when the term is watered down and divorced from its original intention, the housing, environmental, and justice movements loose an important nuance. Any short-term benefit that could come from this slip of language simply would not outweigh the long-term disservice it would be to the neighborhoods of the future. While sticks and stones also make homes, words can hurt community. 5— Non-Hierarchical Structure and Decision-Making: consensus is the primary means of decision-making; responsibilities are distributed according to skills, interests, and abilities. Dominic and his family were founding members of Nevada City Cohousing, and have been active community members since 2006. Having recently graduated from Swarthmore College, Dominic has returned to Nevada City, where he can be found working at McCamant & Durrett Architects, enjoying the outdoors, or spending an egregious amount of time playing board games with his neighbors.